As the beginning of fall has started to loom in the distance, my kids and I have been reminiscing about the summer fun that they've had: swimming pools, sprinklers, climbing at the playground, picnics, and pulling out all of the great toys that stay buried in the garage all winter long. Among those, some of the very favorites and most-used are the outdoor toys. 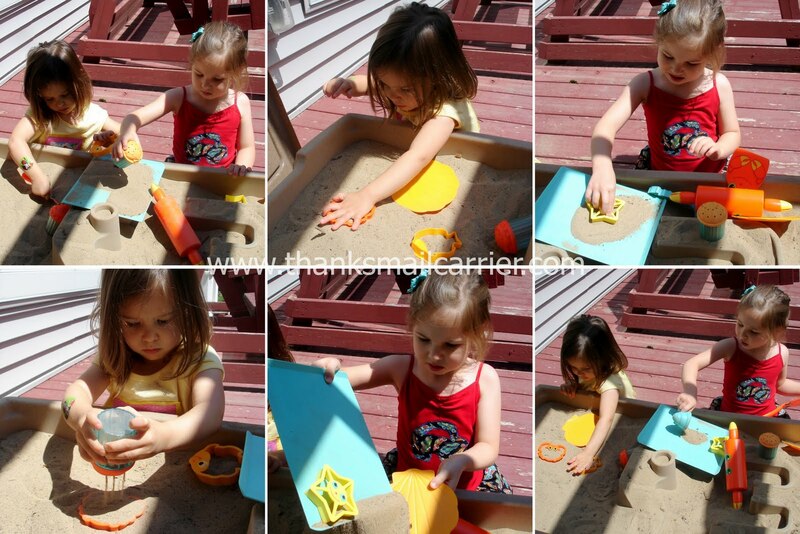 Sometimes I think that I could turn my girls loose outside for hours and they would be perfectly content picking up leaves, playing in our sandbox or at our sand table, or simply strolling around out there enjoying the sunshine. However, this summer we made an effort to get rid of the items that we weren't overly thrilled with - the toys that were poor quality or the shoes that didn't fit or the items that were just not entertaining or unique. Sure, a bucket and shovel are fun, but when it comes to open-ended creativity, imagination and inventiveness, that's when we know to turn to Gummy Lump and their huge selection of Sunny Patch Toys by Melissa & Doug. 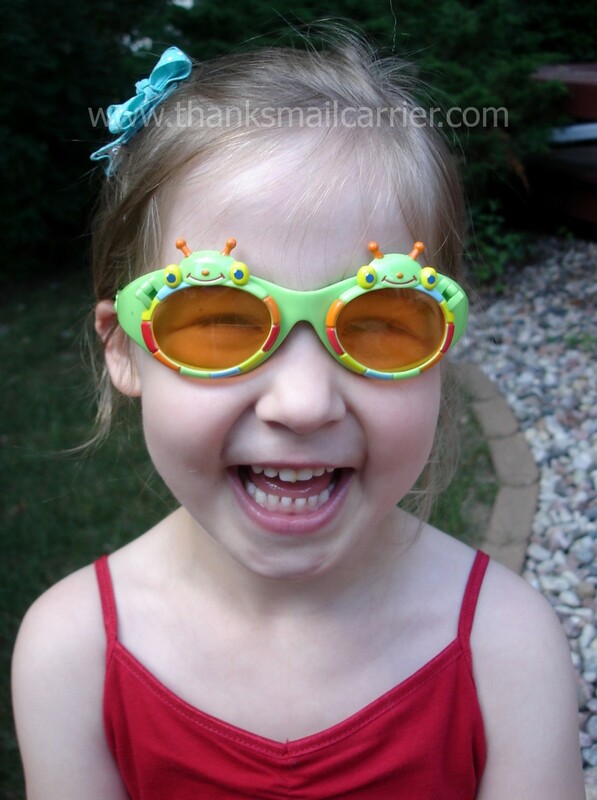 With so many high quality, well-designed educational toys and children's products, I had no doubt that Melissa & Doug and Gummy Lump would be able to bring a smile to my girls' faces this summer... and when the Happy Giddy Flip-Up Sunglasses, Happy Giddy Flip Flops and the Seaside Sidekicks Sand Cookie Making Set arrived, they were instant favorites. Having selected Happy Giddy to adorn her sunglasses and flip flops, I wasn't surprised when Big Sister E was thrilled to see just how cute these items were in person. 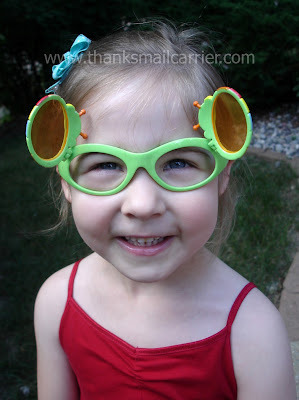 With the bright colors and the addition of the adorable Happy Giddy bug, she wanted to wear these accessories immediately. ...as well as flipped up. What kid wouldn't have fun with these adorable sunglasses? On sale at Gummy Lump now for only $3.99 and available in multiple cute Sunny Patch characters, these are so much fun to wear out in the sun, give as a gift or even pick up multiple pairs for birthday party goodie bags. The only way to make them better? Pair them with the matching flip flops, of course! Available in sizes 6/7 up to 12/13, these colorfully striped Happy Giddy Flip Flops add charm and style to any outfit. 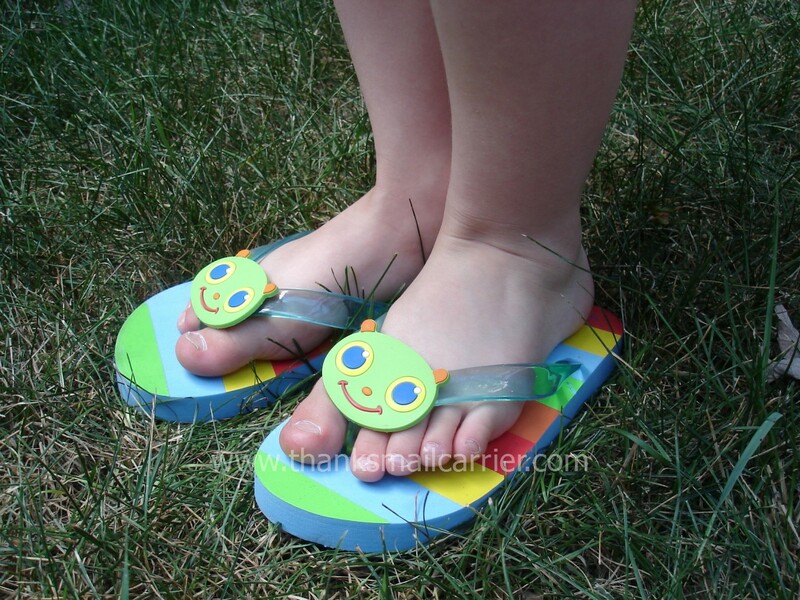 The base is thick and durable and the thong strap is secure and comfortable for little feet. On sale for $6.39 (and also available in multiple Sunny Patch character designs), these are just right for a way to add fun and style all the way down to your child's toes. When it comes to traditional sand play, Melissa & Doug is known for turning it up a notch with toys that last and inspire for quite some time. 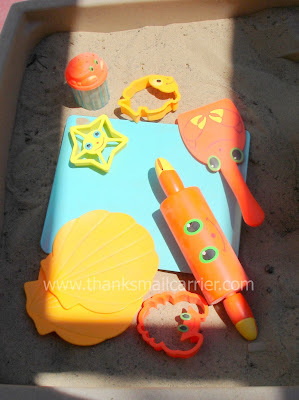 Right out of the package, the bright colors and cute smiles of the Seaside Sidekicks Sand Cookie Making Set were calling out for a fun time in the sand. Much more than just a shovel or two, this set comes complete with three cookie cutters, a rolling pin, a crab-topped "sprinkle" shaker, a cookie sheet, a spatula and two shell-shaped dishes that had my kids delighted right from the start. As it contains multiple pieces, this collection has been great for Big Sister E and Little Sister B to make cookies over and over, whether together or separately... and they've been having a blast! They tend to place the cookie sheet in the middle and then take turns with the rest as they bake and re-bake over and over again. 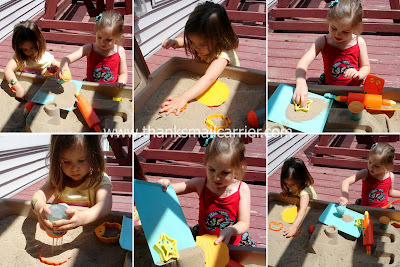 Even though the dry sand in our table doesn't hold the shape of the cookies as well as it would if we were playing in wet sand on the beach, the girls have still loved the unique twist that this set has been able to add to our play. The pieces are cute, high quality and just so much fun! To top it all off, when we're done all of the pieces (minus the cookie sheet) store in a handy mesh bag, making it great for travel as well as allowing the excess sand to fall right off. As with our past Gummy Lump experiences, we've been really happy with these Sunny Patch items and the amount of imaginative play that they have provided. Designed for kids to just let their personal style and creativity take over, these high quality pieces are bright, colorful, fun to use, and are even on sale (the Cookie Making Set is only $11.99 right now)! Whether you're playing at home or at the beach, Gummy Lump's selection of Melissa & Doug Sunny Patch toys and accessories will provide enjoyment for years to come. 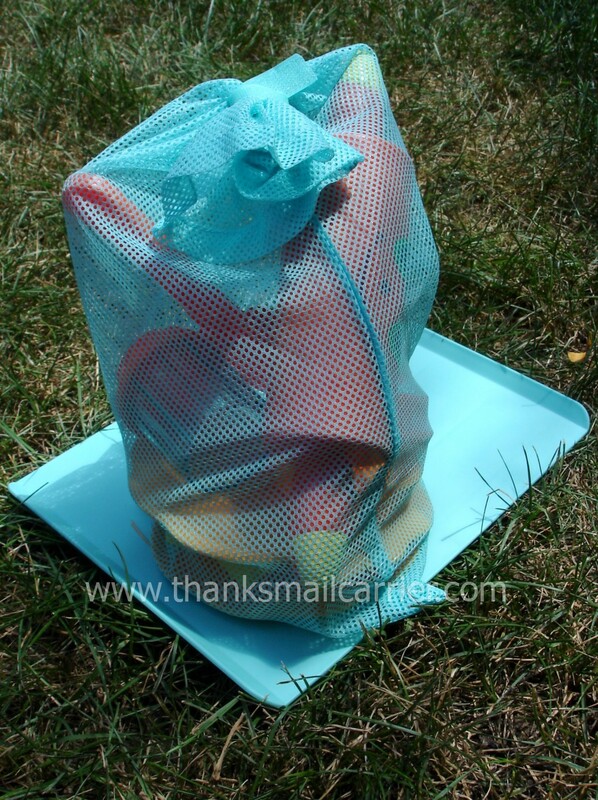 We've had a great time dressing up or pretend baking recently and I know that we will do the same next summer and the following summer and more! One lucky person will win their choice of $25 worth of Melissa & Doug Sunny Patch items from Gummy Lump! To enter to win: Visit Gummy Lump and tell me another of their amazing products that you think the child(ren) in your life would really enjoy. 2 Extra Entries (per follow method) if you follow me with Google Friend Connect, subscribe to my RSS feed, subscribe to Thanks, Mail Carrier by email, become a fan on Facebook and/or add Thanks, Mail Carrier to your blogroll. Giveaway will end on September 9th at 11:59pm CST. Do me the favor of leaving an email address or making absolutely sure it is visible in your profile, I have to have a way to contact the winner. The winner will be chosen by random.org and announced here as well as emailed and will have 48 hours to contact me or respond to notification or a new winner will be chosen. This giveaway is open to U.S. residents only. A big thank you to Gummy Lump for providing the aforementioned products for me to review as well as $25 worth of Sunny Patch items for one lucky giveaway winner. The opinions shared are my own and honest and if you really need to see more, click here to see how I roll. I like the First Play Caterpillar Grasping Toy by Melissa & Doug. I follow the Gummy Lump blog with Google Friend Connect. I follow Gummy Lump on twitter. strawberry_39. I like Gummy Lump on facebook. Sally Grubbs. I follow Gummy Lump blog GFC. strawberry. #1 I subscribe to you by email. #2 I subscribe to you by email. I also like their Sandwich Shop Play Food by Melissa & Doug. I signed up for Gummy Lump's newsletter. Also love Melissa & Doug's "First Play Linking Monkey" toy from Gummylump! Entered your Mabel's Labels giveaway! Another amazing product my child would enjoy is the Trunki Iris Purple Kids Suitcase by Melissa & Doug. Follow GummyLump Blog with Google Friend Connect - Gina F.
I entered the Ajax 2X Laundry Detergent. #1 I follow you Google Friend Connect - Gina F.
#2 I follow you Google Friend Connect - Gina F.
The apple pie playset by Melissa & Doug is adorable! I like the melissa and doug pizza party play food set. I love the sandwich shop play food :) Thanks for hosting a great contest! My daughter would love a trunki! Would love to have the Educo Double Bubble Maze by Hape. I would love the Kitty Catkin Hopscotch!